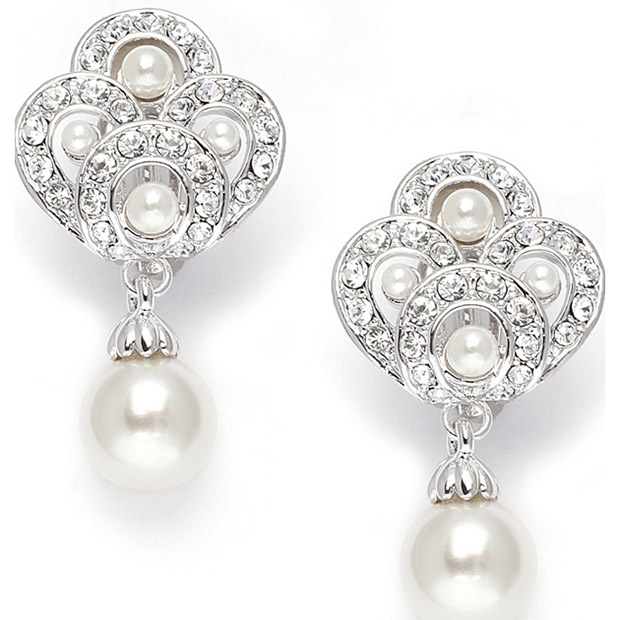 * Bring Art Deco style to your wedding with Mariell's 1 1/2" h x 3/4" w Soft Cream Pearl & Cubic Zirconium earrings. * Our silver rhodium bridal or bridesmaids earrings have 8mm round pearl drops with a chic retro style CZ & pearl fan top. * These Soft Cream Pearl & Cubic Zirconia earrings with a vintage fan motif are plated in silver rhodium with high quality craftsmanship. * This modern version of vintage bridal jewelry is also available in clip as style 3830EC.